A love of wheat and uncompromising will to innovate have turned Crespel & Deiters into one of the leading specialists in wheat-based products in Europe. Our strength is derived our company’s long and eventful history and our employees’ associated experience. A company’s history is always also the story of the people who are behind it. 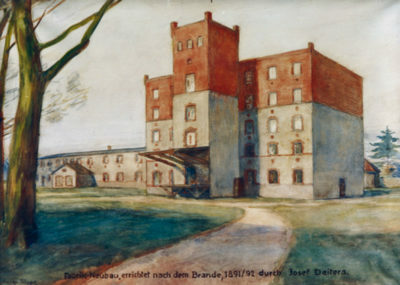 There are the founders who, with their visions, created one of the first starch factories in Germany. There are the employees whose great commitment have driven our company forward. There are the global events that have been inextricably intertwined with Crespel & Deiters throughout its 160-year history. There are the people, developments and events that make us unique. Here you can read what made us what we are today, what makes us different and why Crespel & Deiters has symbolised quality in starch for generations. Tastes just as good as it sounds: Pudinga. The crème powder has been one of the basic ingredients used in every German bakery since 1914. New life arising from the fire: How, with plenty of courage and hard work, Crespel & Deiters turned the worst moment in the company's history into a future-oriented success. How Crespel & Deiters successfully got itself and its employees through the War and inflation with a great deal of creativity and entrepreneurial spirit, and why, sometimes, happiness can also be found underground. From the state of red soil to the state of horses: How Crespel & Deiters expands successfully from Westphalia to Lower Saxony during trying times. About survival during tough times, the battle against chaos and resource scarcity, and how the wheat starch of Crespel & Deiters helped to ensure that the German population had enough to eat. From Westphalia to Saxony and back again: How Crespel & Deiters expands in the east of Germany during the 2nd World War and later on loses it during the GDR again. Why the employees at Crespel & Deiters are so much more than mere workers; why there is a Drei Hasen settlement, and what the pronounced family thought of the company has to do with all of this. How Crespel & Deiters evolved from a factory in Ibbenbüren to a European corporate group with the strength of an entire family, and why even the managing partners only get five-year contracts. Why "Made in Germany" did not always stand for a seal of quality; what the role of the British is in this regard, and how German wheat starch products are conquering the whole world. How Crespel & Deiters revolutionised corrugated board production for the paper industry with the idea of a high performance adhesive made of wheat starch, and how it thereby set the course for the present-day corporate success with the new non-food sector.